This four-star Salzburg hotel is located in the heart of the city. The Mercure Salzburg is within walking distance of many famous points of interest, including Mozart's birthplace, the Mirabell Gardens, the Hohensalzburg Fortress, the Salzburg Cathedral, and the festival halls. The Mercure Hotel Salzburg is in close proximity to the Salzburg airport, and transportation between the two is available in the form of bus, train, or taxi. Most points of interest are within walking distance from the hotel, but public transportation is easy to find, and taxi services can be arranged. Each of the 121 guest rooms are appointed with an en suite bathroom with hair dryers and complimentary toiletries. The Mercure Salzburg City also offers to its guests satellite television, an alarm clock, direct-dial phones, a mini-bar, and room service. 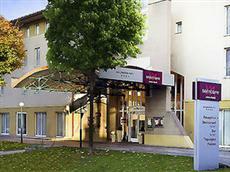 The Mercure Hotel Salzburg City is a modern facility with cutting edge design. A restaurant, terrace bar, and library are all located on-site for guests' entertainment. Business travelers may avail of the meeting rooms and wireless high-speed Internet. There is free parking available for guests, as well as a bicycle rental.